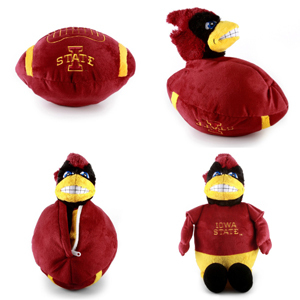 Paul Rhoads recently said that he was very excited about the freshman class and encouraged by the play of all of them. A handful of true freshman should see playing time this season. 1. LB Jevohn Miller #55 (6-4 , 244) – Jevohn got a head start on the rest of the freshman class when he enrolled early and was able to participate in spring practice. The Cyclones don’t have a ton of depth at linebacker and Miller is already running as the #2 WLB behind Jake Knott. I would expect Miller to make his biggest impact on special teams this season. 2. WR Quenton Bundrage #11 (6-1, 176) – Bundrage came to Iowa State as the most ready-to-play wide receiver in the freshman group. He was going to be tough to keep off of the field already, when Keith Blanton left the program and Donnie Jennert was ruled ineligible it became pretty evident that Quenton was going to play this year. 3. SS Jared Brackens #14 (6-1, 199) – He is currently listed as the #2 SS behind Terran Benton. Brackens is another guy that has been talked about as being a standout in fall camp. With his size and speed he should see his way on to several special teams units. Earl Brooks’ knee injury has opened the door to even more playing time for the freshman. 4. WR Ja’Quarius Daniels #5 (6-3, 225) – Started camp at quarterback, but he quickly asked to be moved to wide receiver. Daniels has the size and speed Iowa State has been missing at the WR position. 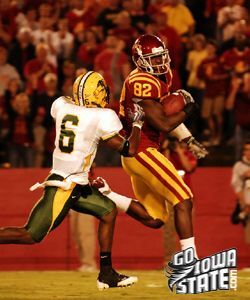 JQ reminds me physically of Iowa wide receiver Marvin McNutt, who ironically also made a move from QB to WR in college. The injuries at WR could put Daniels on the field early in his career. 5. CB Kenneth Lynn #3 (5-10, 157) – Very smooth and quick, Lynn could probably use a redshirt season to build up his body. I doubt we will see him this year, but he could get pressed into action if there are a couple injuries in the secondary. Has a great future on special teams as well. The remaining true freshman are likely to remain redshirted, but all look to have bright futures. DE Devin Lemke #4 (6-4, 213) – Very gifted athlete. Needs to add size to his frame, but has been very impressive to date. DB Sam Richardson #4 (5-7, 172) – Smaller in stature, but built well. ISU is pretty deep at cornerback barring injury. WR Tad Ecby #6 (6-1, 180) – Another true freshman wide receiver that has impressed. Needs to learn the position a little better before he sees the field. RB Rob Standard #10 (5-10, 183) – To me, he was probably the most impressive true freshman in the camp videos. Looked very good running between the tackles, sees the hole and hits it fast. QB Sam Richardson #12 (6-1, 198) – Tom Herman gushed about Richardson at the end of fall camp, said he picked up the offense quicker then any other QB he has been around. RB DeVondrick Nealy #20 (5-9, 178) – Nealy is another explosive true freshman running back, but Iowa State has 4 solid running backs ahead of him in the system. Very happy we can redshirt both Standard and Nealy. DB Darian Cotton#23 (5-10, 184) – Probably needs another year in the weight room, but he should have a bright future. Has the look and temperament of guy that wants to be a great player. DE Nick Kron #69 (6-2, 245) – Coming off of a greyshirt. 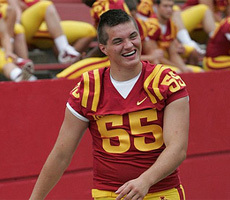 The coaches speak very highly of Nick, but the Cyclones have a ton of depth at DE this year. OL Brock Dagel #72 (6-7, 255) – Most likely a future tackle. Needs time to develop his body. OL Jamison Lalk #76 (6-5, 267) – Another guy that needs a little time in the weight room and system, will probably play inside. OL Oni Omoile #77 (6-3, 280) – Briefly moved to DT, but quickly asked to move back to OL. Very smart, Bleil says his future could be at Center. DE David Irving #87 (6-7, 261) – Has a huge frame for a kid that just turned 18 years old and is already making plays on the field. The force is strong in this one.